Before you begin, you will need to download the Mac version of the BlackBerry Desktop Manager. Perform the following steps to install the software on your computer. Navigate to the BlackBerry website. Select to download the BlackBerry Desktop Manager. Make sure you select the Mac OS X version and not the Windows version of software. Drag the BlackBerry Desktop Manager software into the Applications folder on your Mac. Connect your BlackBerry to your Mac via the USB cable. Plug one end of the cable into the port on your phone, and the other end of the cable into an available USB port on the front or back of the computer. Click Applications, and then click BlackBerry Desktop Manager from the list of programs to open the software on your computer. Name your device whatever you wish, and select the startup sync options. You can choose whether you want the media on your BlackBerry stored in the device memory or on a media card. You can also select if you want to sync other devices with your computer. Click OK to save the changes. Click Calendar on the left, and then click Sync Calendar from the drop down menu. Select a calendar, if any, you want to sync with. Repeat this procedure with the other options showing under Sync, select what you want to sync, if any. Click Sync to sync your BlackBerry. Click Backup to backup the data that is stored on your BlackBerry. If you have never performed a backup of your device before, this would be a good time to do it. If, at any time in the future, you have a problem with your BlackBerry and lose the data on it, you can use the BlackBerry Desktop Manager to reinstall all of your data if you have a back up of your phone. 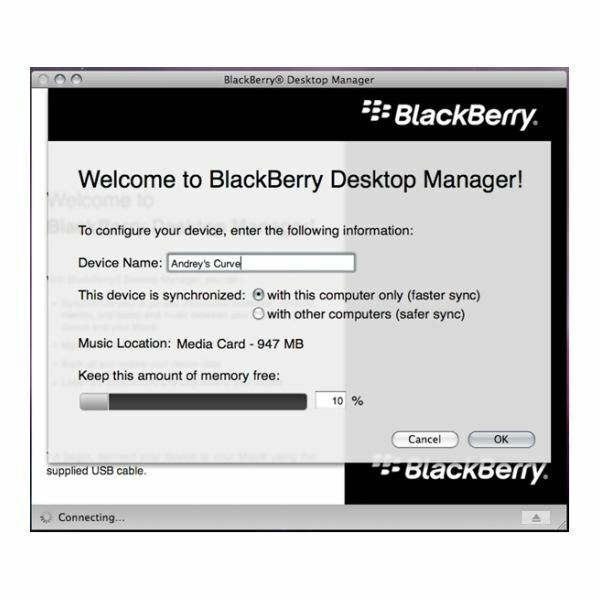 If you purchase a new BlackBerry, you can switch the data and settings on your old BlackBerry to your new BlackBerry using the Desktop Manager software. This includes email messages, third party apps, and organizer data. Connect your old BlackBerry to your computer via the USB cable. Open the BlackBerry Desktop software on your computer by clicking the icon in the Applications folder. Click Switch Device from the Device menu. Using a second USB cable, connect the new BlackBerry to your computer if you have one. If you want to install updated BlackBerry Device Software on your new BlackBerry, check the Update software for my new device, if available check box. If you want to move the third party apps from your old device to your new BlackBerry, if compatible, check the Copy third-party applications check box. 5. Click the Start button to back up your BlackBerry. If you did not connect your new BlackBerry to your computer in the previous step, disconnect the old BlackBerry and connect the new one, and then click OK. If your new BlackBerry has the BlackBerry Device Software 6.0 software installed on it, you can install the Wi-Fi music sync feature on your phone. Check the Turn on Wi-Fi music sync check box, and then click Continue. To add an application to your BlackBerry device perform the following steps. Connect your BlackBerry Smartphone to your Mac computer via the USB cable. Connect one end of the cable into the port on your BlackBerry, and the other end into an available USB port on the Mac computer. Open the Applications folder, and then click BlackBerry Desktop Software on the Mac computer. Click Applications from the BlackBerry Desktop Manager toolbar at the top. Select the check box next to one or more apps listed that you want to add to your phone. Click Start and follow the onscreen instructions to add the app to your phone. Click Applications from the BlackBerry Desktop Software toolbar at the top. Clear the check boxes next to each application that you want to remove from your BlackBerry Smartphone. Click Start and follow the onscreen instructions to remove the apps you selected from your phone. You should not have any problems following these steps, but if you encounter any please leave a comment and I will be glad to help you.